Welcome once again to my world of zoos. I am Stuart Hall, and I once stole a girlfriend from your father. You find me sat in a rather delightful street cafe, supping on Schweppes – fizzy! – and rampant in shorts. “Surely it’s not warm enough for shorts at this time of year?” I hear you wondering. A-HA! This episode was pre-recorded. In Spain. And in all honesty, legs as fine as mine deserve to be aired daily. I find it pleases the locals. I know, I know, I must not digress – my editor is making faces at me that make him appear to be in the middle of a rather troubling bowel movement – you of course do not want to hear about MY mighty pins…oh my no, we’ll save that for later. INSTEAD, you are no doubt eager to get on with our visit, I see in your eyes the intensity of Mark Hughes after miss hitting a volley. “Bleddy hellfiyah, Sam!” But, dear reader, how do you propose to embark on this trip with yours truly, if you have not a clue about where it is I will grace with my presence?! You silly sillys. WAIT! Whats that you say?…. it’s in the title? WELL! In that case put down your Estrella Damm, return the waitress to her owner and slide into my classic automobile. You must be well-behaved though, this isn’t ANY zoo, this is THE zoo. NO! NOT Zizou. Listen! NEVER ZIZOU. Welcome once more to my World of Zoos, I am Stuart Hall, and I knew your mother quite well in the 1970s. Due to the so called credit crunch I am loathed to report that I haven’t been jetted off to far flung lands, rich in biodiversity and exotic cocktails. I do like a cocktail. But I digress. NO! So I shall be visiting a zoo in our very own Londinium Town: Tottenham Hotspur. The kind folk at FistedAway offered me money for the omnibus, and I declined; I do not, and shall not, use public transport (though I confess, I do like the sound of an ‘oyster card‘. Delicious!). This is not because I am adverse to you, the public – o, heavens no! I love you all like an absent Uncle who is somehow still your favourite – but it is style, dear boy, style that concerns me. Wouldn’t you rather step crisply from a gleaming automobile than stumble from a motorised Charabanc? I would, so I pocketed the cash and fired up the Jaguar S.
But I am a disciple of time – a lover of clocks, the slipping sands and the endless beat – so I shall not waste any more of yours, lets take a look inside. The path ahead leads to a gate; a gate beyond which a veritable bounty of farmyard life sprawls. HEAR YE, HEAR YE! 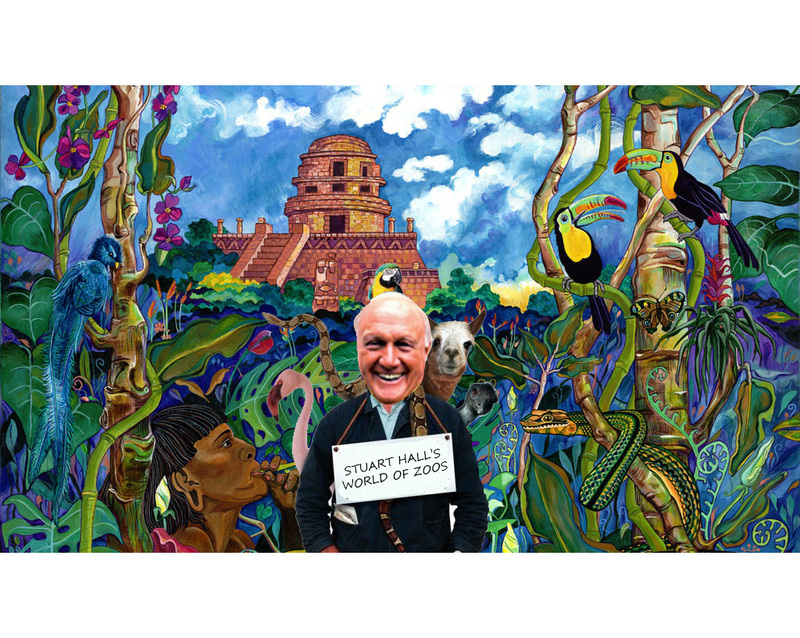 Stuart Hall here crouched ready to spr-r-ring into action and take you on another whistle-stop tour of one of the world’s top zoos. As a Manchester City fan, the choice of this instalments zoo pains me – BUT! I have taken a thorough dip in disinfectant and donned my hazard suit, so let us begin. Today we take a trip to the self appointed ‘biggest zoo in the world’. A zoo which, though based in Manchester, is a favourite with southern types who think nothing of abandoning their local zoos and then strut around like they have the largest genitalia known to human kind just because their adoptive zoo finishes at the top of the zoo premier league. It’s a BLOODY DISGRACE. Of course the facilities are nice, and the range of animals on offer is exceptional, but like the lion in the Wizard of Oz it sadly has no heart. EEeeenough! “THE ANIMALS STUART!” I hear you cry it heartily, with whiskey-soaked passion, like David Moyes shouting at himself in a mirror. “NO, YOU LISTEN TO ME YOU GINGER BASTAAAD, YOU SAID SAHA WAS OVER HIS INJURY TURMOIL! DAMN YOU MIRROR-MAN“. But I knew Louis would continue to have problems and I don’t talk to myself in the mirror, so I shall digress no further. Welcome, WELCOME! Push through the thickets, THE FERNS! Come, come ye gentle folk for I have many wonders to show you. This week we take a trip to Milan, a city once conquered by Napoleon. I am in possession of a clock that was once owned by Monsieur Bonaparte. IT TICKS! I gaze, transfixed into its dial. IT TOCKS! We are as one. The Zoo is known as the Associazione Creatura Milano or AC Milan, for that is its name. Founded in 1899 by two fine gentlemen, Alfred Edwards and Herbert Kilpin. Bred of good Nottingham stock, strong as fence posts, bold as brass. BR-R-RITISH! The days of Empire, rule Britannia and the chorus of bread boys in the morning. But enough of this idle chin wagging, THE ANIMALS STUART! I hear you cry it heartily, with whiskey-soaked passion, like Alex Ferguson ordering a takeaway from his local. They can’t make him out with their sideways ears. NO, SET MENU D, D, for Darren, DAMN YOU CHINA-MAN! But fear not, for my ears are large, upright and alert and I will heed your pleas, as a benevolent King would feed his starving peasants.